Very healing for humans, cats, dogs, horses, helps kidneys, great skin poultice for ulcers (stomach and skin) and healing skin conditions. Slippery Elm (Ulmus fulva), also known as Red Elm, Moose Elm or Indian Elm, Is a small tree native to North America. It has been a part of traditional herbal medicine for over 100 years, and was used by North Americans and early settlers as a survival food during lean times. Tradition has it that the American troops who spent the bitter winter at Valley Forge during the Revolutionary War survived for days on slippery elm gruel. 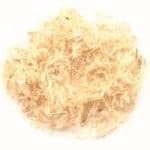 Slippery Elm is a soothing herb that is consumed in many forms including lozenges and liquid extracts.